A sweet dessert that is made from a cake batter which rises up as it bakes, forming a browned crust that is then traditionally topped with berries. Originally, buckle was made as a single layer cake topped with blueberries. 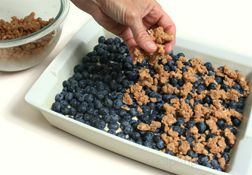 However, over the years a variety of berries, fruits and toppings have been added to make different versions of this cake dessert. 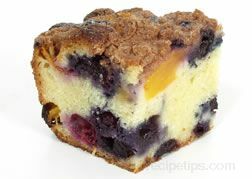 It is often made with blueberries and another fruit combined into the cake topped with a crusty sugar coating.